That’s right, BrandQuery hit that jackpot in 2017. And you know what that means…we have to tell someone! Call it beaming pride or shameless bragging, but we worked hard in 2017 and we have the results (awards) to prove it! We opened up the year with two big and meaningful acknowledgments from the Cancer Awareness Awards. 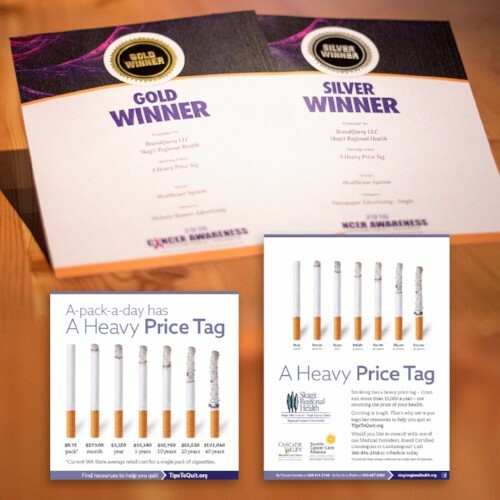 In collaboration with Skagit Regional Health we created a series of print and digital ads which highlighted the dangerous and costly effects of smoking and lung cancer. Continuing our work in healthcare, BrandQuery created a campaign for Skagit Regional Health‘s MyEClinic, which allows people to contact a licensed medical provider over their phone or tablet. The all-encompassing campaign consisted of digital, print, billboard, and radio advertising. 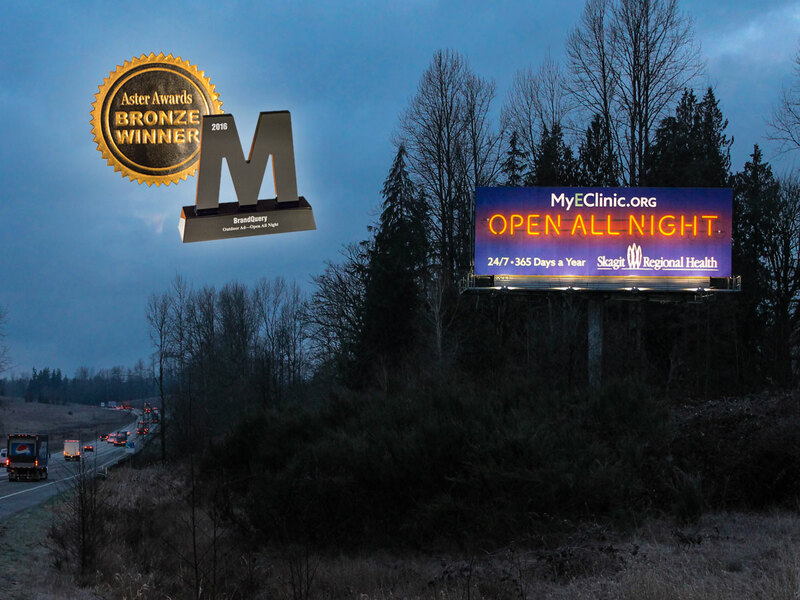 BrandQuery was presented the Bronze Award from the Aster Awards, which honors excellence in healthcare advertising, as well as the “Big M” award by the leading marcomm publication in Washington State at the NW Marketing Awards. Our next award brings us to, well, the most exciting box you’ve ever seen (at least we think so). 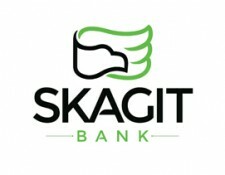 Working with our client Skagit Bank, we wanted to create a piece that not only introduced them into the Ballard neighborhood, but also created community engagement. With a little story telling, some crisp $1 dollar bills and impeccable product packaging, we created the “Dollars in a Box” promotion. 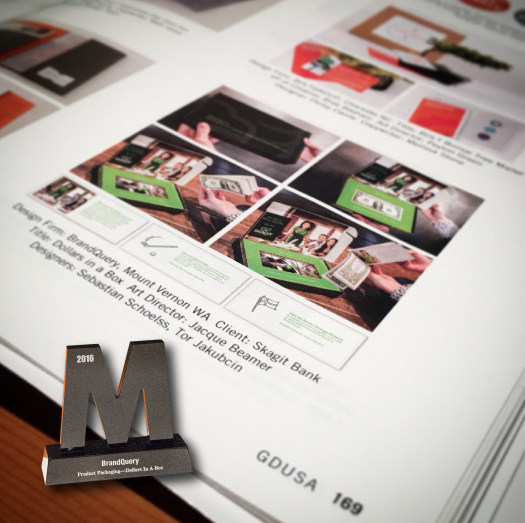 BrandQuery was awarded “Best Product Packaging” by Graphic Design USA – no. big. deal. As well as, the “Big M” from the leading marcomm publication in Washington State at the NW Marketing Awards. Read more about our special box here! And last, but certainly not least, one more award for our great client Skagit Regional Health. 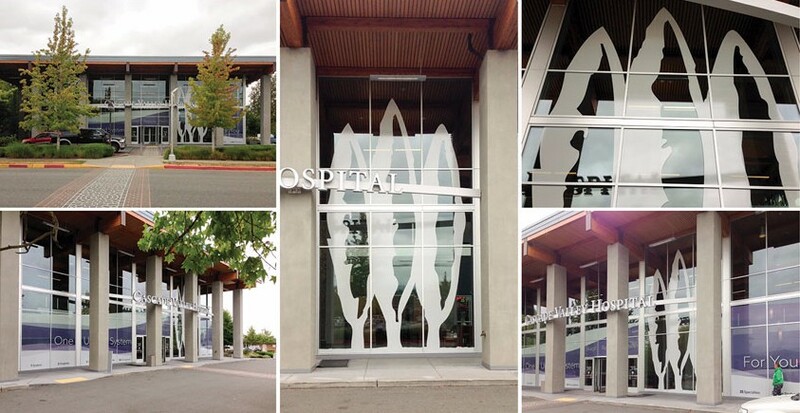 BrandQuery created new window graphics for Skagit Regional Health’s Cascade Valley Hospital. 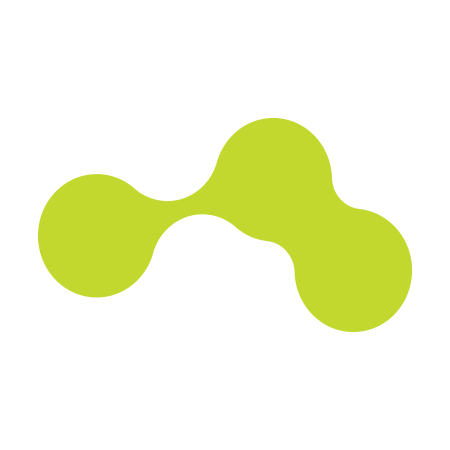 BrandQuery was awarded the 2017 Health + Wellness Award by Graphic Design USA. Thank you to all who voted and recognized BrandQuery’s work in 2017 (and also for letting us brag a little). We are looking forward to producing even more meaningful and impactful content in the new year. Until next time!